such as Jeque and Shanni. JEQUE means donkey in Portuguese. 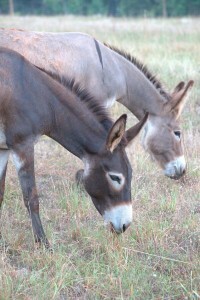 Jeque and her daughter Shanni were the first donkeys to arrive at FCFS. Jeque is very sweet and intelligent and enjoys leaning on volunteers for scratches. SHANNI is Jeque's daughter. She and her mother were the first donkeys to arrive at FCFS. Shanni loves apples, carrots, and ear scratches. Sponsor Jeque and Shanni today!